Either print this, or copy & paste to Word to print, or download using the links above. In Word, if you set page margins (left & right) to 0.7cm, you'll get 2 invites per A4 page. Please come along to My Perfume Party to celebrate my birthday where we will be creating our very own unique perfumes. 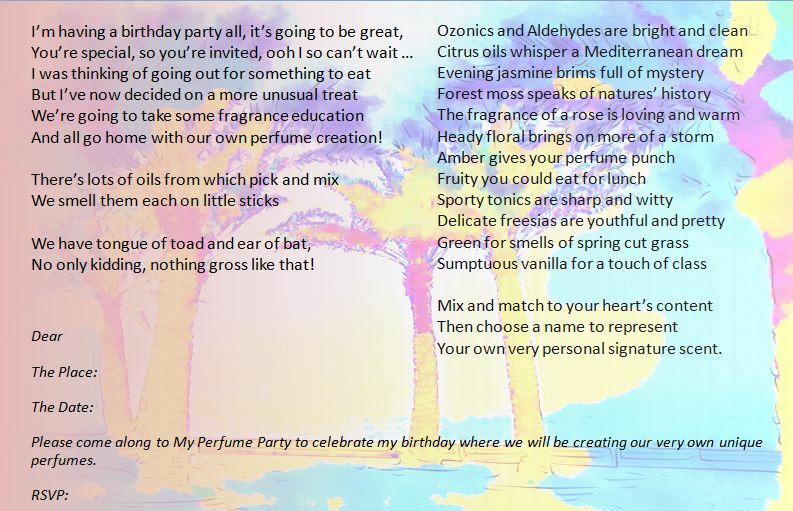 I’m having a birthday party all, it’s going to be great, You’re special, so you’re invited, ooh I so can’t wait … I was thinking of going out for something to eat But I’ve now decided on a more unusual treat We’re going to take some fragrance education And all go home with our own perfume creation! There’s lots of oils from which pick and mix We smell them each on little sticks We have tongue of toad and ear of bat, No only kidding, nothing gross like that! Ozonics and Aldehydes are bright and clean Citrus oils whisper a Mediterranean dream Evening jasmine brims full of mystery Forest moss speaks of natures’ history The fragrance of a rose is loving and warm Heady floral brings on more of a storm Amber gives your perfume punch Fruity you could eat for lunch Sporty tonics are sharp and witty Delicate freesias are youthful and pretty Green for smells of spring cut grass Sumptuous vanilla for a touch of class Mix and match to your heart’s content Then choose a name to represent Your own very personal signature scent.